Aww, I just want to hug and touch that cute little wild cat! Home » Awwwww, I want one! The story is so often the same. An owner who loved cats, who bought the wild cat as a cute and cuddly cub. Who thought they’d make a great pet. An owner who just wanted to hug one. Who was told by the breeder that, if hand-reared, the wild cat would act tame. An owner who didn’t realize their homeowner’s insurance would drop them, that it would be impossible to find a vet, that their city or county prohibits possession of exotics, that the cost would be so much, and that at sexual maturity, their furry baby would change. But, because of physical space, financial restraints, staffing resources, and so many factors, we often have to say no. And we know the situation is the same for almost every accredited sanctuary in the country they might all. So, the fate for that cat can be hopeless. Zoos won’t take them in as they face the same issues, a finite amount of space. Their wild cats come from their Species Survival Plan breeding program. Perhaps another private owner will be found. But cities and counties that allow a cage in the backyard for a carnivore are becoming fewer and fewer – which is a good thing. The cat may be given or sold to a traveling exhibitor that visits fairs and malls. Life will be spent in a small cage on a truck without the benefit of any natural habitat at all. 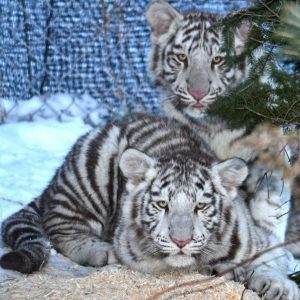 Conditions can be inhumane and deplorable, especially with current USDA regulations allowing a concrete-floored, fenced cage no larger than a parking spot for a full-grown, big cat’s entire life. Or, the cat can be sold to an exotic meat distributor since we’re seeing a new fad at restaurants offering lion tacos and burgers. The meat isn’t USDA or FDA inspected, so it’s a guess how many suffer this fate. There are more than 1000 captive hunting facilities in the USA. 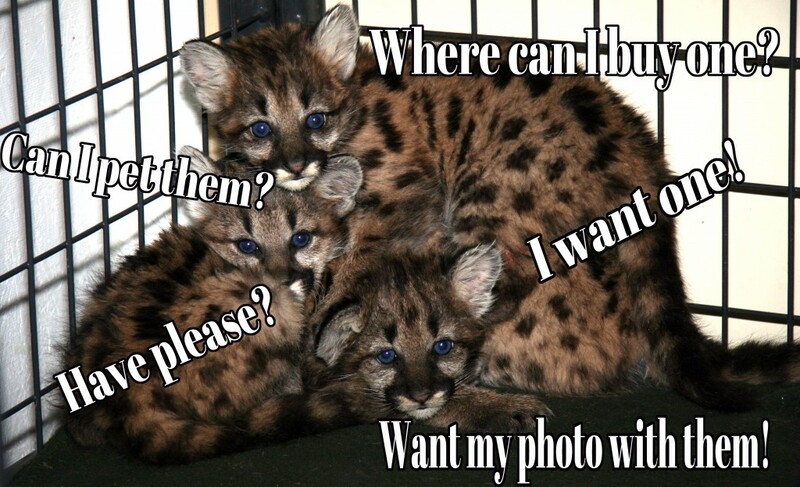 Shooters at captive hunts pay to kill animals trapped behind fences. Often the animals are hand-raised and bottle-fed, so they aren’t afraid of people. It’s horrible to imagine, but this can be where many failed “pets” and “photo op” exotic animals end up, too. It’s estimated a dead tiger is worth up to $50,000 for its parts. With few inspectors, the USFWS can’t possibly track the thousands of tigers bred each year, illegally sold into this lucrative trade. These are the scenarios that go through our head when the phone rings. We try so hard to educate everyone we come in contact with about the realities for these cats, the ones that have nowhere to go. It’s a key part of our mission. That’s why, when we read a comment like “I want one” or “I’d love to pet one” or “Where can I buy one?” – it’s heartbreaking. But, then again, we remember this is an opportunity to educate someone who only sees the cute, alluring eyes of the tiger cub or cougar baby. They don’t realize how something that’s a “thrill of a lifetime” is really a death sentence for that cat. And we hope that, once we explain, they’ll pay it forward, teaching others. And, one day, we’ll pass a law like the Big Cats and Public Safety Protection Act that will cut down on all this misery and suffering.